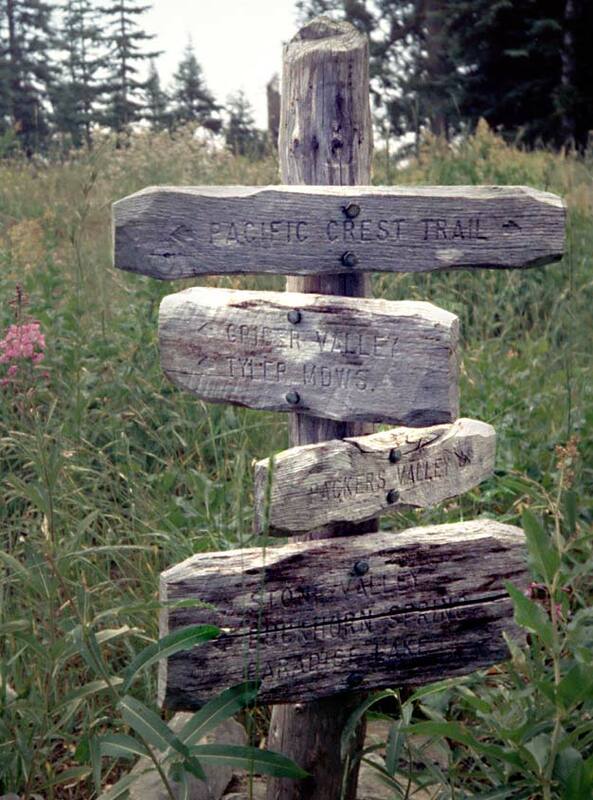 I'd like to lay my weary bones tonight on a bed of California stars"
Introduction From the Oregon border to the north, the Pacific Crest Trail in Northern California follows a wide sweep eastwards to connect with the Sierra Nevada mountain mass to the south. 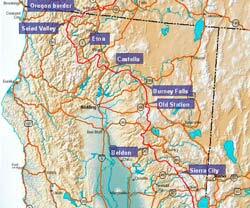 There is a great deal of variety in this region; from live volcanic activity in the shape of steam vents and hot pools around Mt Lassen and the dominating snow covered cone Mt Shasta to the more rugged Trinity Alps with the metamorphic Marble Mountain. Forest covers much of the lower terrain but the trail takes in some extremely arid semi desert areas as well such as Hat Creek Rim near the resort of Burney Falls. Towns passed through tend to be small country stores and lodges as the trail avoids any larger urban areas. 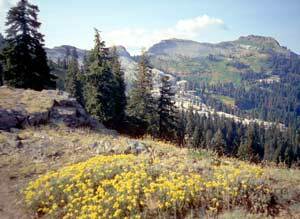 Seiad Valley, the first stop south of the border lies deep in the trench of the Klamath river, 5,000 feet below the ridge crest of the PCT. We would be hiking this area in mid to late August and the hot daytime temperatures would be our biggest danger even higher up in the mountains. Despite having various aches and pains, our condition was fairly good by now - having already hiked around 1,500 miles in all kinds of terrain and Martina thankfully seemed to have recovered from her prolonged bout of giardia. Our slight concern at the back of our minds as we left the Oregon border on the 17th August was that our summer was beginning to draw to a close and we still had around 1,000 miles to go, with the final section over the Sierra Nevada, the highest mountains on the Pacific Crest Trail and the ones most likely to attract autumnal snow. Anyway, we just kept on hiking and waited to see what weather we would encounter. 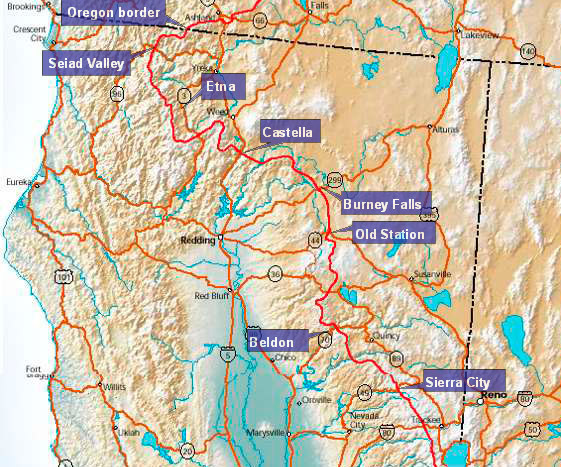 Our guidebook split the PCT into alphabetical sections and it was the name 'Section O' between Burney Falls and Castella that was much talked about amongst hikers as being the worst section of path on the whole trail. Indeed we first heard about the infamous 'Section O' back in northern Oregon. This area was still being actively logged and the trail disappears for miles on end under a tangled mesh of fallen trees and bulldozed dirt tracks. 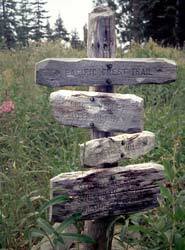 (Note: I understand that the trail has been upgraded substantially in this area since we were there in 1998).